Odin Biron, a young actor from Minnesota, moved to Russia almost seven years ago because he has always believed that Russia is home to real theater. He arrived knowing almost no Russian, but he spent four years studying at the Moscow Academic Art Theater School and, soon after, blended into the acting community. Biron was recently given the role of an American intern in Russia’s latest popular sitcom, Interns (a Russian version of Scrubs). He spoke with Sofia Raevskaya about his life in the Russian theater scene. Russia Beyond the Headlines: How would you say you imagined Russia before you arrived? What did it turn out to be like? Odin Biron: I had always pictured Russia as a kind of romantic place. A cold, distant country where people work their magic in the dark; a crazy, scruffy, imaginative place. I would picture Russia, first and foremost, as going together with the theater and the arts, and this was personified through Valery Gergiev of the Mariinsky Theatre. This fascinated me, for some reason. I find it a complex, enticing life. Everything at the beginning had to do with the theater, because I had dreamed of coming to Russia to study at the Moscow Academic Art Theater School and to work. I myself come from the very cold state of Minnesota, so I was already prepared for the weather. As it turns out, Russia has a lot of warmth. I can’t say how I got such a romantic picture of Russia. To tell the truth, life here is so seductive, difficult, remote and wild. It was hard at first, but then I got used to it. Things turned out, of course, to be a lot less romantic. As for stereotypes of Russians, I never thought that you drank vodka all day long or that bears wandered around Red Square. I would say that Russians made up most of the stereotypes about themselves. I didn’t even know that Russia’s symbol was the bear. RBTH: Have you had any adventures while in Russia? O.B. : Just being in Russia is a never-ending adventure for me! It’s really interesting to see how things develop here; I’m even afraid to go back to the U.S. This is still all an adventure for me. People ask me what I am doing here, while I say that living in a different culture and a different country is an adventure, don’t you agree? It’s really cool! I find all the old stuff and the history very interesting. Take, for example, when I took the train from Moscow to Irkutsk. I saw so many impressive things! I was on the train for almost four days and saw a lot of the country; I wouldn’t mind doing it again! I dream of going to Vladivostok, Karelia, Sakhalin and Kamchatka. So, all in all, there are more adventures to come. I have also taken the train to Lithuania and Latvia, and we have been on performance tours to various countries. I also decided to come to Russia seven years ago, because there are a lot of really intriguing neighboring countries. I dream of traveling across Asia, including Armenia, Uzbekistan, Kazakhstan and Azerbaijan; this is also in store for me. These are exotic countries for your average American. My friend and colleague Cazimir Liske and I were once invited to an international festival in Iran. I really like these kinds of place. It was really hard to get a visa, almost impossible (because of U.S. foreign policy). Really beautiful cities, Muslim countries, mosques, etc. All this is possible because I am here. RBTH: How hard was it to learn Russian? O.B. : I’ll say right off that I am interested in languages. I used to study a lot of languages: Italian, French, Danish, etc. When I started to study Russian, I forgot them all! I even started to forget English! I started to study Russian back in the U.S. at the University of Michigan. I stopped by this really good library from the university once, with a handful of books. I found a cosy little corner and found an old Russian language textbook for foreigners, published back in the Soviet era. I started to read it and tried to make something out of it on my own. I sat there for three hours and began to read and copy things down. I remember that, at that time, I began with simply copying down the alphabet, and what a discovery it was for me! This was a week before I left. I learned words like Zdrastvuyte (“Hello”), Spasibo (“Thanks”) and Pozhaluysta (“Please/You’re welcome”). How I pronounced them, I don’t know. It sounded awful. Foreigners want to study these words when they visit Russia, which is funny because these are the toughest words in the language. I more or less knew these words and the alphabet. I started off working through interpreters while I was doing a three-month internship at the Moscow Academic Art Theater. After that, living in the school’s dormitory was virtually all I did, while I barely studied at the theater. I’ve never had better Russian practice in my life! I took classes at school and attended Russian-language courses. My teacher, Yelena Lisina, gave me everything. She gave me grammar and introduced me to the Russian language. I started studying in September 2005. I initially acted in silent skits, where language wasn’t important. Then I started to study poems. The most intense Russian lessons I had were when it came time to learning lines for various scenes. I needed to learn Ostrovsky’s The Storm, Shakespeare’s Hamlet and Pasternak. Had to learn everything. This was the most important stage in studying Russian, although I still learn new words every day. There are times when it is really hard to express myself, especially when I’m in a bad mood. The grammar is really tough. 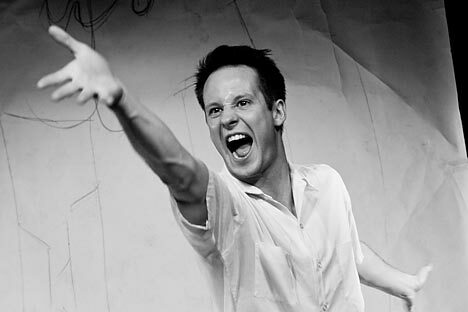 When I was playing Hamlet, it was really terrifying one of the first times I went out on stage in front of the audience! I had this feeling that I had just memorized some sounds and believed that they all meant something for the audience. The other actors, if they suddenly forgot something, could make something up and improvise. I, on the other hand, didn’t have that option, especially with Pasternak. Doing so would sound just clumsy and bad. When you have someone else’s thoughts in your head, you usually confused. You forget the words and don’t know how to put a sentence together. It’s really terrifying when, after having spent a long time back home in the US, I come back to the stage, have to learn something really quickly and say the words in front of the camera, while everyone is waiting for you. I get this feeling as if I have forgotten Russian. But I want to overcome this fear. RBTH: Do you have any favorite Russian songs, performers or films? O.B. : I used to sing Russian romances at school. They are really beautiful songs. To be frank, I haven’t really found something in Russian music that I really like. My favorite music lately has been bluegrass, the oldest style of American music, complete with violins, guitars, etc. American folk music is a genre that is almost unheard of in Russia. When I get feelings of nostalgia, I listen to bluegrass. I love Russian and Soviet films. As I see it, Russia has a very rich history of cinematography. The fantastic films include Moscow Doesn’t Believe in Tears, The Diamond Arm and Kin-Dza-Dza. Office Romance is a really funny film and a good quality comedy. I watch it without dubbing or subtitles and understand everything. It’s like Pushkin in that it’s impossible to translate. I think that the Russian film classics are better than in the U.S.; Soviet traditions simply amaze me. Your traditions, Mosfilm studio traditions included, are very interesting and good. I enjoy watching. RBTH: Do you have time for anything else besides work? O.B. : I do, indeed, have little free time, but I don’t let it get to me, because otherwise I would get down on myself if I don’t have work. I see Moscow as a place for both work and imagination. My brother and I write to each other a lot; he lives in Nepal. We bought some land back in Wisconsin and are thinking about what we can do with it. It’s very interesting for us. If I have time, I like going for walks in the park and riding my bike around the city, although it’s usually to work and back. When I first came to Moscow, I covered almost all of Moscow on foot and both saw and found out a lot. I know my way around here, both in the center and in the parks. I really like it here, especially the architecture. The small, two-storey buildings in the center, the history. The city is really nice now, during the spring. You could walk around until one in the morning. The entire city is out for a walk, and that’s great! I get a shot of positive energy from this. In New York, the “concrete jungle,” that is tough to do. I have been to other cities as well: Suzdal, New Jerusalem, Pskov, Baikalsk and Yaroslavl. I really got inspired by the Russian spirit. The people in these places are truly open and jolly. Things are tougher in Moscow, of course. But these are just masks they wear on the outside, while on the inside people are much better than they seem. Things are the exact same way in any big city. New York, for example, has it much worse: that place is just insane! In Moscow, though, people are more restrained. A lot of people think that they are cold and unpleasant; however, as soon as you go to their apartment, you notice their incredible sincerity and kindness! All too often, Americans smile insincerely, while in Russia that’s not the case, especially in Siberia! RBTH: Did you think that it was realistic to put together a Russian-American theatrical project? Something new and of your own? O.B. : Yes, Cazimir Liske and I would like to found a theater, but we don’t know how to do it yet. We are going to the U.S. this summer; there are already two shows with Russian actors and we want to do more. We dream of organizing a theater center to serve as a unique bridge between Russia and the U.S., so that Russian actors come to the U.S. and American actors to Russia. Yes, that’s the dream we have. I am confident that I have learned a lot here and I would like to continue with what I am doing. I think I will only fully realize what I have learned here when I return to the U.S. A year or five years later, I will start to comprehend what I can pass on to others. RBTH: How does a day on the set of Interns go? How did you get your role on the show? O.B. : Things are really good, I feel at home. They just called my agent one day and offered for me to come for an audition. They had been searching for a person to play an American intern for a long time. It had been a long time since I had gone to any audition, since I thought that being on screen wasn’t my forte. But then they called and, for some reason, I remembered that this show had caught my interest when I saw an ad for it in the metro, even though I didn’t have a television at home. I did the audition and realized that I had totally flunked it. I wasn’t able to do anything right! Even so, they called me a week later and invited me to come back for a second round of auditions. This time around, I played the role alongside Ivan Okhlobystin, who plays Doctor Bykov in the show, and the rest is history. I don’t know how things went so well. I wasn’t looking for it, rather it just happened. That’s the best thing of all! I really like working there, although right now it’s difficult, since we have been working for five months now non-stop and people are getting a bit tired. RBTH: Would you like to act in Hollywood films or do you prefer the theatre? O.B. : I’ve thought about it. I have been to Los Angeles and met very important people, such as agents and producers. They told me that if I wanted to work there, I needed to live there. But I wasn’t ready to live there. This was before I got the role on Interns. I didn’t even have a portfolio at the time. Now I know that it was good that I decided not to go there. What’s more, Los Angeles is a really tough city. If you are going to work there, then it is either at someone’s invitation or not at all. Actors there compete ruthlessly with one another for roles, and I’m not ready to get into all that. In other words, I’ll give it a try only if the right opportunity comes up. It could be at someone’s invitation, through Moscow or Europe, little by little. Deep down, there probably is the thought of conquering Hollywood, but I haven’t woken up to it yet. Although maybe I just don’t want it all that much. I don’t know right now. Theater is more my thing. There’s no way you can substitute for rehearsal and being interactive with the audience. As my teacher Konstantin Raikin says, this is being interactive, the power and might over the audience. This is a very important part of the theater. I find this more interesting for now. With film, though, everything hinges on the project and the director you work with. I want to work with people who aspire to create something. RBTH: Do you ever get homesick? O.B. : At times, and especially recently for some reason. I turn on US radio on the Internet. I’ll eat a hamburger, call my Dad, friends, and grandmother to hear the Minnesota accent. I really like looking at plane tickets home. It’s like a pill: you take it and you feel better. One look and you’re gone! At the same time, I don’t want to cut Russia off. I feel that I have some roots here to a certain extent. I’ve gone through a lot in Russia. If I move back home, I will miss Moscow.